Who better to tell a story than a storyteller? Tylie has become a sought after motivational speaker who has the uncanny ability to bring the entire room together into a collective story that's funny, powerful and memorable. Yes, she speaks at Christian events regularly, but her true on-stage forte takes place in the business arena, where she combines her humanity and her expertise to motivate, educate and fascinate. The Power of Choice (Based upon Tylie's upcoming book release, The Power of Choice) - In this dynamic presentation, Tylie outlines how life is fully dictated by the choices we make in any given moment, how renewing one's mind can influence the choice-making process, and how learning to master the power of choice can dramatically alter the course of one's life for the better. Attitude Equals Altitude - Back by popular demand, this powerful session highlights the vast importance of attitude in day-to-day living. Tylie uses both humor and history to turn her own story into actionable, life-changing lessons that anyone can use to find the 'happy' in their living, no matter what they face. "Carry the watermelon" all the way to the life you've always wanted. This was 2016's most popular presentation, and shows no signs of slowing down. G.I.D. For Hot Messes - Based on the popular GID program (open enrollment for 2017 starts Jan. 1) - This presentation is best served in two to three sessions, but can be accomplished in one if needed. The presentation focuses on SUSTAINABLE, guilt-free, stress-free organizing, task management, and productivity. 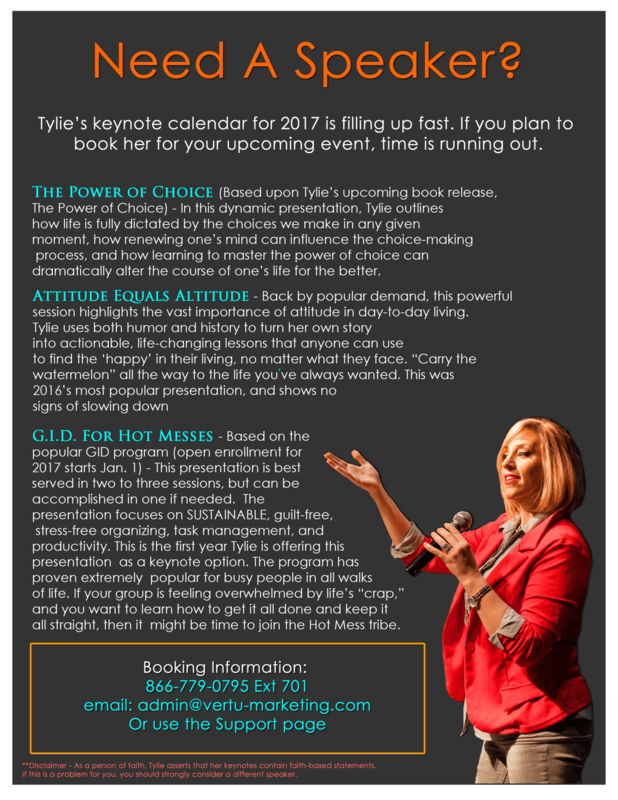 This is the first year Tylie is offering this presentation as a keynote option. The program has proven extremely popular for busy people in all walks of life. If your group is feeling overwhelmed by life's "crap," and you want to learn how to get it all done and keep it all straight, then it might be time to join the Hot Mess tribe. Custom Keynotes - Do you have a specific keynote need? Tylie will customize a presentation for your event, based on your specific needs and audience. **Note, this option requires at least 90 days notice and pre-booking. **Disclaimer - As a person of faith, Tylie asserts that her keynotes typically contain faith-based statements. If this is a problem for you, you should strongly consider a different speaker.